As you may know, if you’ve been reading PopCult for the last month, I spent much of last week in Atlanta at JoeLanta/The Great Atlanta Toy Convention. I came back with a ton of toys, but also a ton of video and still images. After taking a couple of days to recover from the trip, it’s time to start sharing video. First up though, I’m bringing you two videos that I didn’t make. Tim and Lisa Weedn stole the film festival with “Joe @ Fifty” and Bambi Lynn from Radio Cult treats us to the JoeLanta dance montage, which I managed to avoid being in (I danced in public once, and the next day laws were passed to keep it from happening again). After that, we have our first panel video, The Walking Dead Discussion Panel, with Luke Godfrey, a set-dresser for the show, Mike Gardner, a fan and the creator of an incredible diorama that you will see bits of in this video and much more in later videos and posts, and Melanie Larch, a fan of TWD. an actor in Eamon Hardiman’s “The Crawling Dead,” and my better half. The image at the head of this post is a plaque embedded in the sidewalk of Senoia, at town we visited as part of the JoeLanta tour last Thursday. 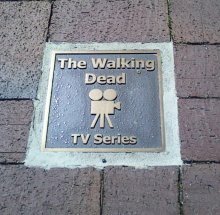 If you watch “The Walking Dead,” you may recognize Senoia as the location where The Governor ruled the town of “Woodbury.” Video from that tour is rendering as I write this, so be patient and keep checking PopCult. Next up we have Bambi’s Dance video. The PopCult Bookshelf will return next week. Thanks for the plug, Rudy. Pleasure to meet you and Mel. JOELANTA ROCKS!